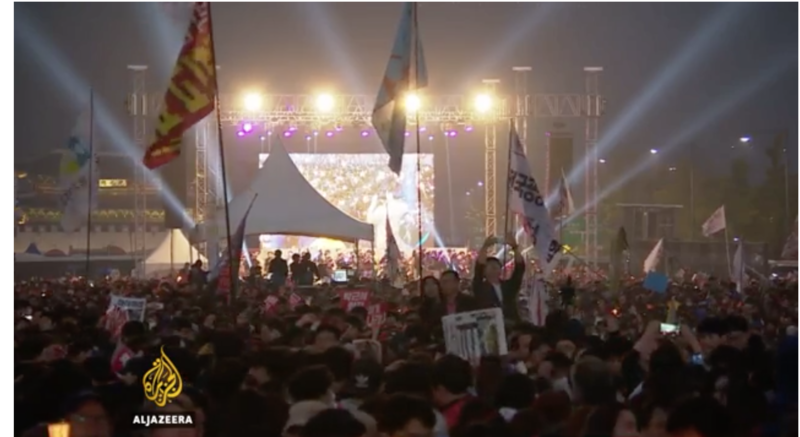 South Korean media report 1 million gathered at Gwanghwamun Plaza to demand Park Geun-hye’s resignation. This is the largest protest South Korea has seen since the democratic uprising of June 1987. People from across the country, including conservative strongholds Busan and Daegu have traveled to Seoul to join the protest. Youth in school uniforms and mothers with children are among the protest. Protesters on the way to the Blue House are blocked by a barricade of police buses near Gyeongbok Palace. The police have also blocked off entrances to subway stations between the police barricade and the presidential residence. Protesters are intent on reaching the Blue House but so far remain peaceful. A reporter outside the Blue House says protesters can be heard from the Blue House, which has been in a state of emergency since Saturday morning but has not issued an official response to the calls for the president’s resignation. The Korean Confederation of Trade Unions has vowed a general strike if Park Geun-hye refuses to resign. 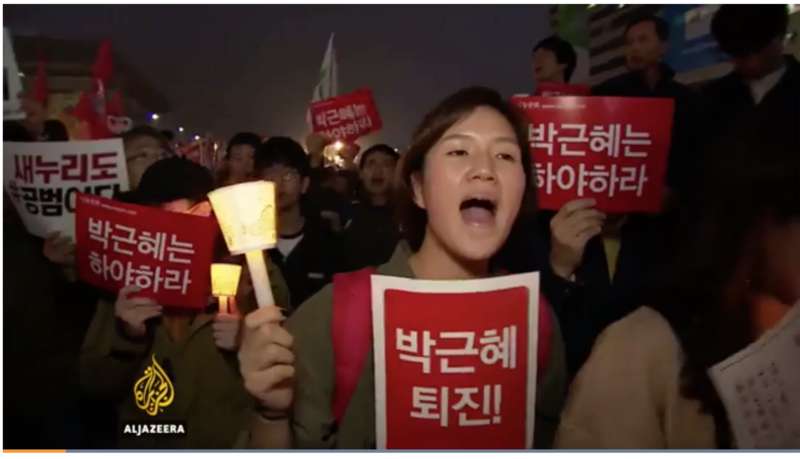 150,000 workers are among the protesters at Gwanghwamun Plaza- 35,000 public sector and transport workers, 20,000 government employees, 15,000 metal workers, 15,000 service workers, 10,000 teachers, 5000 health and medical workers. 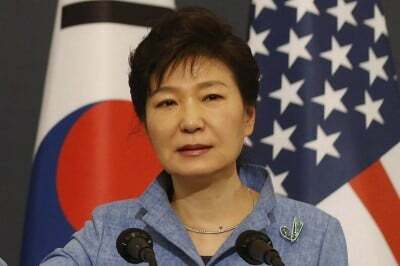 The Saenuri Party has called for an emergency meeting tomorrow amidst growing calls inside the party for Park Geun-hye to leave the party and its leadership to resign. For updates on the historic demonstration, follow ZoominKorea on Facebook and Twitter.